Find the perfect matching tie for your bridesmaid dresses or matching bow tie for your wedding colour theme with our sizeable colour palette. Our expert team have perfected the best range of shades and tones for 2019 wedding colour trends and 2020 weddings. Browse a selection of customer submitted wedding photography for inspiration, all images contain Mrs Bow Tie wedding ties, wedding bow ties, pocket squares or braces. Dress to impress - it’s your big day! You’ll remember this day for the rest of your life, so you deserve to look your absolute best - and we’re here to help. A suit and shirt are smart, but the accessories you choose will be the stand out part of your outfit. We’ve been part of over 90,000 weddings worldwide so we know how to help you get exactly what you’re looking for. Need help with arranging your order? Email support@mrsbowtie.com for expert assistance. 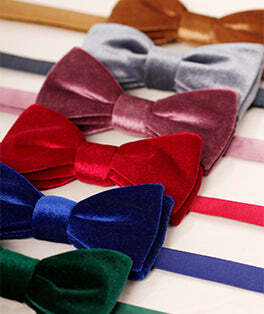 Shop our huge range of bow ties, where you’re sure to find the perfect match for your wedding. From floral to paisley, we have hundreds of beautiful designs perfect for weddings of all colours. Complete your look with this small but superb accessory that will add a dash of stylish detail. Whether you want something sophisticated or quirky, we’ve got a great range of cufflinks for you. Adding this extra detail to your tie makes a huge difference. Shop our stylish collection of tie bars. Made in Britain and available in a variety of colours, our dress socks make excellent wedding socks. From the very beginning, we have been a design-focused brand. We were fed up of seeing the same looks, patterns, and designs at every retailer, so we set out to buck the trend and focus on cool, unique and fashionable designs that cater for everyone, no matter their style or purpose. Need a tie for work that is sure to make you stand out? We’ve got a tie for that. Want a tie that colour matches your bridesmaid dress, but isn’t a plain colour? We’ve got a bow tie for that - and the pocket square to match.